Dey Street Books, 9780062696847, 352pp. In the fall of 2016, Allan Lichtman—the Distinguished Professor of History at American University who has correctly forecasted thirty years of presidential outcomes—made headlines when he predicted that Donald J. Trump would defeat Hillary Clinton, to win the presidency. 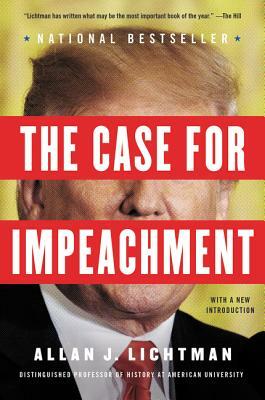 In this timely, considered volume, written in clear, nonpartisan terms, Lichtman lays out the reasons Congress could remove Trump from the Oval Office: his ties to Russia before and after the election and his possible obstruction of the investigation—including firing F.B.I. Director James Comey—the complicated financial conflicts of interest at home and abroad violating the Constitution’s Emoluments Clause, and his abuse of executive authority. The Case for Impeachment also offers a fascinating look at presidential impeachment proceedings throughout American history, including those involving Andrew Johnson, Richard Nixon, and Bill Clinton. Lichtman shows how Trump exhibits many of the flaws (and more) that have doomed past presidents, and argues, with clarity and power, that for Donald Trump’s presidency, smoke has become fire. Historians, legal scholars, and politicians alike agree: we are in politically uncharted waters. The cost to the nation is high: the durability of our institutions is increasingly being undermined and the public’s confidence continues to erode, threatening American democracy itself. Allan J. Lichtman is Distinguished Professor of History at American University in Washington, DC, and formerly Associate Dean of the College of Arts and Sciences and Chair of the Department of History. He is the author or co-author of eight books, including most recently, FDR and the Jews (with Richard Breitman), which won the National Jewish Book Award in American Jewish History, and was a New York Times Editor’s Choice pick and a finalist for the Los Angeles Times Book Prize in History. He has also been a finalist for the National Book Critics Circle Award. He lives in Maryland.